The terms medical assistant and medical assistant technician are often used interchangeably. Most medical assistants are cross-trained to perform administrative and clinical responsibilities, however, the medical assistant may only do one or the other, depending on the facility they are employed with. Medical assistant duties vary by health care facility and depend on the size and location of the practice. Medical assistants are usually the first and last people that patients see when they are at a medical facility. Please continue reading to find out more about what it takes to become a medical assistant. Find local medical trade schools with a variety of medical career programs including accredited online medical assistant. A huge growth in employment is projected for medical assistants. The Bureau of Labor Statistics site states there will be a 29 percent growth between now and 2026. This is much faster than the average for all occupations. Factors driving this increase for medical assistants are the aging baby-boomers and the expanding physician practices to accommodate patients. Medical assistants, at median, earn $32,480 annually. The highest 10 percent will make an annual salary of $45,900, and those new to the field will earn closer to $23,830. Keep in mind, these numbers are the national scale. Factors such as geographic location, type of practice, and amount of experience can make those salaries look different for you. 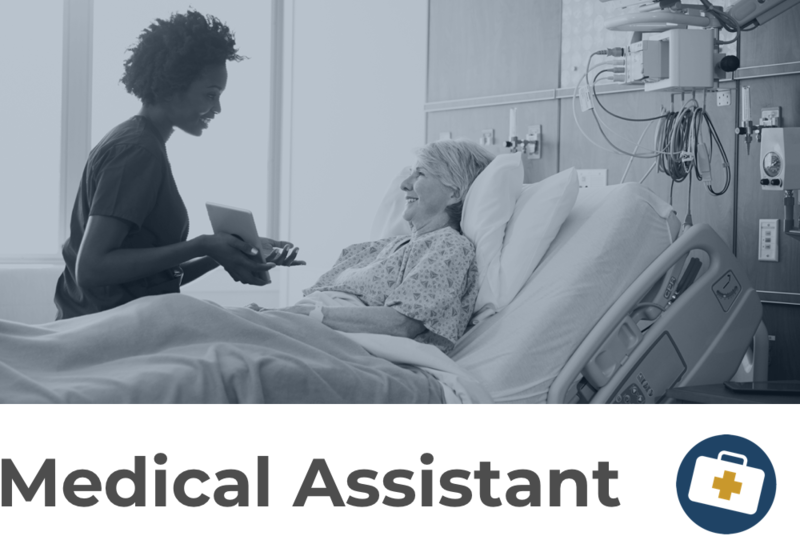 Medical assistant duties include both front-end and back-end tasks, including greeting patients, answering phones, updating and filing medical records, handling various insurance forms and correspondence, and making appointments when needed. Often times medical assistants will also arrange hospital admission for a patient or handle laboratory services. Clinical responsibilities vary by state, but they can include taking medical histories, recording vital signs, prepping patients for exams, providing treatment and procedure explanations, and assisting the doctor during an exam. Other duties include collecting laboratory specimens, performing laboratory tests, disposing of contaminated supplies, and sterilizing medical instruments—all under the supervision of the physician on staff. Clinical: Clinical medical assistants are not qualified to provide the same type of care as a nurse or doctor. However, they are still extremely beneficial in helping with patients by recording their medical history, explaining procedures and care with the patient and their family, preparing the patient for their exam, and prepare and deliver medication to the patient. Other duties a clinical medical assistant may be qualified to do are drawing blood and receiving specimens, performing tests on the specimens collected, performing EKGs, removing stitches, and dressing wounds. Administrative: In some healthcare settings, medical assistants are tasked with strictly administrative duties. They deliver forms and assist the patients in filling them out, they take care of the appointments, they work with the insurance companies, and they update patient records. Administrative medical assistants provide assistance to the healthcare facilities' in-house billers and coders, as well as the doctors and nurses. Like many other careers in the medical field, medical assistants have opportunities to specialize. Listed below are the many different areas that medical assistants can specialize in. Ophthalmic and optometric medical assistants help provide eye care. They may have to show patients how to use contact lenses, or assist doctors in surgeries. Podiatric medical assistants help podiatrists make foot castings, aid in surgeries, and take care of x-rays. EKG/cardiology: To specialize as a cardiology medical assistant, some extra coursework may be necessary. EKG/cardiology medical assistants perform EKGs and stress test procedures. Obstetrics and gynecology: Hands-on training is necessary for this specialized portion of medical assisting. Helping the doctor with procedures such as PAP testing, breast exams, and caring for pregnant women are duties in this specialty. The medical assistant MUST be certified for this field. Medical billing and medical coding: Medical billers and coders work directly with the insurance agencies to insure the proper payment amounts are going to the right people, whether it’s the insurance agency, doctor, or patient. Further specialization can occur within this field, as either hospital or ambulatory care coding. Certification through the American Academy of Professional Coders or Board of Medical Specialty Coding and Compliance is required. Medical administrative assistant: As a medical administrative assistant, you’ll work directly alongside the management team. Medical administrative assistants will take notes during meetings, create documents and spreadsheets, work on office policies, and other administrative duties that are assigned to them. People person: A medical assistant deals with a large amount of people on a daily basis on a variety of levels. You need to be friendly enough to confidently go from patient to patient to get done what’s necessary, all with a smile and an outgoing demeanor. A more introverted person may feel uncomfortable in this position. However, even an introvert can become a work extrovert with practice! Compassionate: Compassion is a key ingredient when the medical assistant is working with patients who aren’t feeling well. You need to be supportive and give some emotional comfort to patients while they are waiting to be seen by the physician. Strong communicator: Medical assistants need to be excellent at effectively conveying information. You'll need to be an active listener to fully understand what is being told to or asked of you. Organized: On any given work day, a medical assistant will see multiple patients. This means an awful lot of paperwork, patient files, and names to be kept straight. Because one little mistake can go a long way in the wrong direction, you must maintain strong organizational skills. Team player: Medical assistants work in medical facilities. They are part of a team that included the physician, nurses, medical staff, and the patients and their families. There is no room for a rogue player. If you don't want to help your team, then be aware there are other medical assistants out there looking for jobs that will. If you can’t play on a team, then you should probably consider careers for soloists. Detail oriented: To be an effective asset to the medical team, a medical assistant needs to pay attention to even the most minute details when it comes to the patient. Something you notice that someone else missed can help the team better assess the situation. Adaptable: Each day brings different experiences in the healthcare industry. Technology, procedures, and daily office life are in a constant state of movement so a good medical assistant needs to keep up with the daily changes. You need to be flexible and easily roll with the punches. Ethical: HIPAA laws protect patients confidentiality rights, and medical assistants are bound to these rules just like the rest of the medical staff. Gossiping about and discussing patients is strictly prohibited. Everything you experience with the patients is protected. Excellent medical assistants play by the rules and keep their eyes and ears open while their mouths are closed! It may seem like the options for medical assistant programs are limitless, which can make it feel confusing when picking your program. When starting your search—and inevitably making your final choice on medical assistant programs—there are a few factors to consider. Is the program accredited by the Commission on Accreditation of Allied Health Education Programs (CAAHEP) or Accrediting Bureau of Health Education Schools (ABHES)? If the programs are not accredited by either of those two, then students are not eligible to take the certified medical assistant (CMA) exam. Is the tuition plus cost of books and supplies something that you can afford? Find out from the school if they have a financial aid program to bring the cost down to a more reachable figure. What type of degree are you want to get? Certificates or associate degrees are possible. Does the school offer those options? What are the class sizes, and are you comfortable with those numbers? Some thrive in large classroom settings, while others benefit from smaller classes. It’s strictly a personal preference. Does the school you’re considering have a job placement program for its graduates? A job placement program is a great way to land your first job and gain the necessary experience for your future jobs. What are the graduation rates and CMA exam passing rate of the schools you’re looking at? The higher the number, the better off you may be! Students are required to have earned a high school diploma or its equivalent to become a medical assistant. Employers typically insist that medical assistants pursue further education including receiving their certified medical assistant (CMA) documentation, but there are some medical facilities that will train high school graduates or GED holders in-house. Most community colleges offer two-year associate degree programs for medical assisting. There is also the trade school or vocational school route, which takes a year to complete, and the student earns a diploma. Both programs will usually include a combination of classroom and practical training. Medical assisting programs are also available through online courses that allow students to go at their own pace. Hybrid programs, which include both online and on-campus training, are also viable options. On-campus training programs have set schedules that can include courses at any time of day. The only drawback to those is the lack of flexibility given to the students. Online training, while exceptionally flexible, doesn’t include the required training portion. That is left entirely to the student to find. The hybrid programs have the "best of both worlds," in that courses can be done at the student’s pace because they are online, but they include the lab work and training at participating campuses. Becoming certified is not required, but it’s highly recommended due to the fact that employers prefer their medical assistants to be certified. Another benefit to medical assistant certification is that it is reflected in the paycheck. CMAs earn an average of $8,000-$12,000 per year more than non-certified medical assistants. To become a certified medical assistant, the training program must first be completed. Exams are given in January, June, and October, every year. You must take the exam between 30 days prior to program completion and up to a year after the program completion and your diploma or degree had been earned. Non-recent graduates have up to a year after their course has been completed. And you may also apply to be re-certified if you had already taken and passed the exam but need re-certification. Only those who graduated from an accredited program are qualified to sit for the certification exam. How Much Do Medical Assistant Programs Cost? A one-year medical assisting program through a vocational school can cost between $1,200-$4,200. The same kind of program through a community college costs $2,500-$10,000. Depending on whether your are a state resident or not, an associate degree through a community college can run between $600-$5,400 a year for residents and $2,700-$5,400 per year for out-of-state students. There are very few additional costs involved with medical assisting programs aside from school supplies and classroom materials. However, one additional cost is the certification exam given by the American Association of Medical Assistants (AAMA) and that costs either $125 or $250 depending on if you are a recent graduate or and/or a member of the AAMA. The medical field is filled with excellent opportunities, and one of the fastest ways to get involved is through a medical assisting program.